Launching from Earth in August 2011, the Juno spacecraft will arrive at Jupiter in 2016 to study the giant planet from an elliptical, polar orbit. NASA made history today, launching humanity's first Lego figurines into space. That's the word that's going around the Web, and it's absolutely true, so let's get that part out of the way first. At 12:25 p.m. E.T. on Aug. 5, the Juno probe lifted off from Cape Canaveral, headed for a rendezvous with Jupiter in 2016. On board are three figurines  made by the Lego folks  of the Roman god Jupiter, his wife Juno and Galileo Galilei, who in 1610 discovered the four large moons of Jupiter. Such grace notes are what it sometimes takes for the launch of an unmanned spacecraft to get much attention. But the mission Juno is embarking on, as well as the ship itself, are far more newsworthy than that for a whole lot of reasons. Jupiter  with twice the mass of all of the other planets combined  is not just the biggest planet in the solar system; it is also a sort of progenitor world, little changed since its earliest days. It thus affords a living look into the protosolar system, providing important clues as to how the smaller, rocky planets  Mercury, Venus, Mars and, significantly, Earth  formed. The more we learn about Jupiter, the more we will thus learn about ourselves. 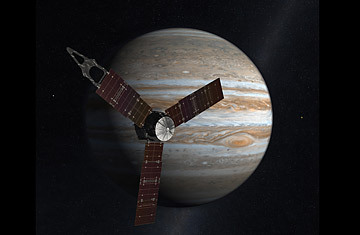 Juno will by no means be the first spacecraft to make the Jovian journey. Pioneers 10 and 11 and Voyagers 1 and 2 swung by the planet in the 1970s. The Galileo probe gave Jupiter a much more thorough going-over, spending eight years orbiting the planet from 1995 to 2003 and firing a probe into its swirling clouds. Those missions answered a lot of questions about the chemistry and structure of Jupiter, but they left a lot unanswered too. No one knows yet if the planet is entirely gaseous or has a solid core, for example. Equally mysterious is just what's behind the colorful bands and massive red spot that are Jupiter's aesthetic signatures  and how deeply they extend into the lower atmosphere. More intriguing is the operation of Jupiter's powerful magnetic field. The intense pressure within the Jovian atmosphere causes some of its hydrogen to take on metallic properties  at least in terms of its molecular configuration  and this helps power a magnetic engine that produces explosively bright auroras at the planet's poles. Juno will enter what's known as a polar orbit  90 degrees above and below the familiar path most ships travel around a planet's waistline  providing earthlings with the first images of Jupier's highest and lowest latitudes. Those pictures will probably be the headline makers of the mission, at least in the public mind, but the scientists are more interested in the data that will be gathered by the spacecraft's other instruments, which include a plasma and particle detector, an ultraviolet spectrometer, an infrared spectrometer and a microwave radiometer for taking soundings of the deep atmosphere. Keeping that much hardware running at a maximum distance of 600 million miles (970 million km) from Earth will not be easy over the five years it will take the probe to get where it's going and the year it will spend making 33 orbits of Jupiter. The Cassini probe, currently orbiting Saturn, carries an on-board nuclear reactor because at such vast distances, solar power is impractical. Jupiter  which gets just one twenty-fifth the sunlight that we do on Earth  is not a whole lot brighter than Saturn. But innovations in solar technology have produced light-collecting panels that are 50% more efficient than older models. That should provide just about all the juice Juno needs, particularly since its main observations and thus its peak energy requirements will occupy only about six hours of every 11-day orbit. If the Galileo probe's mission is any indicator, Juno will probably get more than just its planned year of orbital life. NASA traditionally lowballs the capabilities of its ships, both to keep public expectations in check and to give mission planners a manageable must-do list. After that checklist is complete, a well-functioning ship is usually given more to do. When Juno is at last done with its work, it will probably meet the same spectacular end Galileo did. To prevent a collision with one of Jupiter's moons  particularly watery Europa  which could contaminate theoretical Jovian life with microbes from Earth, Galileo was instead sent on a death plunge into Jupiter itself. The ship that came to study the giant world thus became a part of it  as could the one that took off from Earth today. See TIME's complete space and astronomy coverage.